Are you building a new stable for your horse? Or, perhaps you are renovating another building to serve as a stable. In either case, here are the basics of designing a safe, comfortable stable for your horse. According to the Canadian Agri-Food Research Council, Recommended Code of Practice for The Care and Handling of Farm Animals, a loose box should be 10'X10' (3mX3m) to 12'X12' (3.6mX3.6m) for an average size riding horse. These are minimum recommendations. If you have the resources to build larger stalls, you can, of course, build them larger. 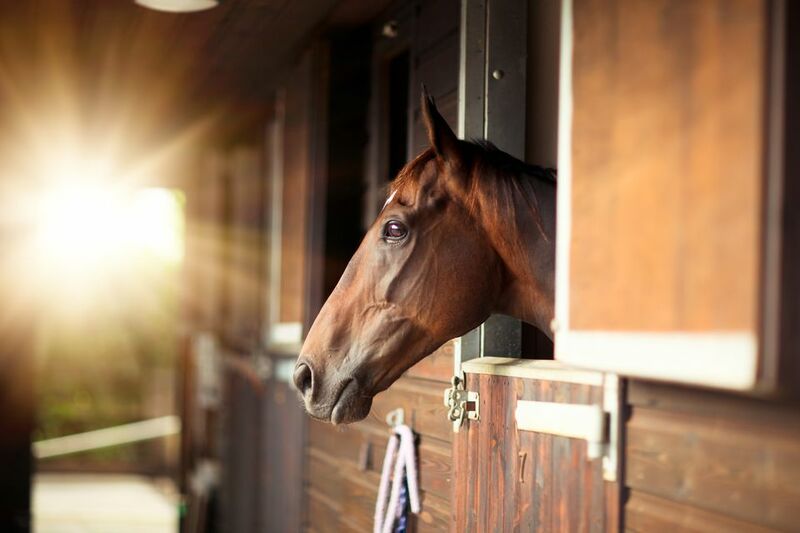 Larger horses will appreciate the extra room to move around, so if you have a draft or draft cross, adding extra space will help them move freely, and lie down without feeling cramped. Although the recommended size for a foaling stall is the same as a regular stall, many people like more generous sized boxes for mares and foals. The easiest way to provide roomy accommodations for mares and foals is to take the partitions out between two regular stalls. So you don't have to build a stall specifically to be a foaling stall. Even if you don't plan to have a foal, it is handy to design at least one stall with this in mind. Standing or tie stalls need to be wide enough for a horse to lie down in comfortably. Depending on the size of the horse, they should be at least 4ft to 5ft (1.5m) wide and 8ft (2.4m) long. There is usually a manger for hay at the front of a standing stall, so the width of this should be considered. A pony will need a shorter and narrower standing stall than a larger draft breed, which again will need more space. There will also need to be a sturdy structure to tie to. It should be high enough so the horse cannot get its leg over the tie rope, but still be able to reach feed and water. In both standing and box stalls, the walls should be solid, sturdy lumber to at least 4.6ft (1.4m) high, and above that, grill or sturdy mesh so that horses can see each other. This also helps with ventilation and light. Stall doors can be either swinging or sliding. In either case, there should be latches that undo easily, but that horses cannot tamper with. Many stall Houdinis have escaped and let out a few friends for an overnight stable ransacking. That ends up a clean-up headache for the owner, as well as a possible safety and health hazard for the horses. Swinging doors should open out into the alley, and be kept shut at all other times. They should fasten securely shut so horses don't escape. Sliding doors should slide smoothly. Grain room doors should be locked. Doors should be at least 4 ft (1.2m) wide. Alleyways between stalls should be at least 10ft wide (3m). The wider the better, so there is room for horses to pass when being led, or be tied to groom. The most commonly used flooring in stables is concrete. If the surface is roughened, it is non-slip. concrete, pavers, or stone floors will not drain naturally, and drains may have to be placed in stalls. Many stables do not have drainage. This means stalls must be well-cleaned to avoid ammonia build up. Hard flooring such as pavers or concrete are also easier to disinfect and can be hosed down if necessary. These floors are harder on a horse's legs though. Many people put stall mats made of rubber like material under the bedding for greater comfort. If you have sandy soil, you may decide to leave the earth and not lay down a solid floor. This flooring is easier on the horse's legs and may be warmer and quieter than an un-matted solid floor. Earth floors are harder to clean and will need digging out and replacing if the dirt becomes too saturated with urine and water. Many older barns designed for cattle have low ceilings that are not high enough for horses. Sometimes these barns can be raised, or the floor dug lower if drainage patterns permit. This tends to be a costly procedure. Ceiling height should allow the horse to raise its head comfortably without worrying about hitting the ceiling. A standard room height of 8ft (2.4m) might be fine for ponies and small horses, but taller horses will need higher ceilings. Furthermore, make sure there are no protruding nails from second story flooring, hanging light fixtures that are unprotected, or other obstructions that horse could hit accidentally when it raises its head. All lighting and wiring should be installed with safety in mind. All plug-ins in stables should be GFIC receptacles, and wiring should be rodent and moisture proof. Check what type of lighting is recommended for outdoor use in your area. Fluorescent bulbs may not work well in extreme cold. There should be safety cages around light bulbs, and they should be placed where horses cannot reach them. Switches should be well out of reach of curious horses. Try to arrange light fixtures so there is a minimum of dark or shadowed areas. Work areas, tack and feed rooms should be well light for safety. Windows provide natural ventilation and lighting. Incorporate as many as possible in your stable design. They should be covered with a grill or mesh so horses can't break the glass. Windows that swing open may work better over the long run than sliders that tend to fill with dirt and chaff making them stick. You'll need to decide how you will water your horses when they are stabled. The most economical option is a bucket hung upon the wall. Buckets on the floor can get knocked over making a mucky mess. In the winter, heated buckets keep the water free of ice. Electrical receptacles with GFCIs will be needed close by for each bucket. Automatic waters mean no carrying sloshing buckets, but it is more difficult to monitor the horse's intake. You won't know how much (or little) your horse is drinking. Some horses may be fussy about drinking out of them, and they need to be insulated against freezing temperatures. The bowls need frequent cleaning. A bucket on the wall can suffice for feeding concentrates out of, or you can purchase wall mounted feeding tubs. Hay can be served on the floor-wasteful if the horse throws it around and soils it. Or you can build a manger for hay. Mangers need to be deep enough to hold the hay and have no gaps that horses could catch legs in if they lay down beside it. They also need to be easy to clean out. Wall mounted racks and hay nets are not recommended for everyday use because they make the horse or pony eat in an unnatural position with its head up instead of down. Hay nets are also a hazard because horses can easily become entangled.